Longtime comedy writer/producer Peppiatt (1927–2012) looks back on his life as one of the busiest men in TV history. Born in Canada just as the Roaring ’20s abruptly segued into the Great Depression, the author graduated from the University of Toronto and, after graduation, much to his father’s chagrin, took a menial job at a local radio station. From there, he gradually worked his way into writing scripts for radio. By 1952, he was a TV writer for the fledgling Canadian Broadcasting Company. By 1958, he and his writing partner John Aylesworth were in New York writing for popular singer/show host Steve Lawrence. During the next 20 or so years, Peppiatt and Aylesworth crisscrossed the country from New York to LA, writing and producing one variety show after another, including Sonny and Cher, the Steve Allen Show, Hullabaloo and even the countrified TV smash Hee Haw. Peppiatt was the classic raised-in-the-Depression workaholic, but he eventually had to choose between marriage to his work or to his wife—of course, it didn't help that his first wife was a jealous harpy who resented his success even as she embraced its fruits. Banal domestic turmoil aside, though, there are plenty of memorable moments here, especially when Peppiatt finds himself having to deal with drama queens like Julie Andrews, Judy Garland, Cher, Doris Day and others. Peppiatt’s prose is conversational and classy, although, disappointingly, there are few clear examples of his professional comedic style. 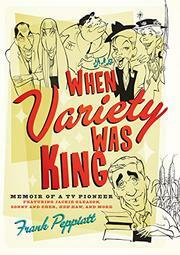 A simple but often fascinating look at TV history through the eyes of one of the medium’s seminal figures.